Keep a few Bug Bracelets in the tackle box and boat. Keep Bug Bracelet handy when camping and enjoying the outdoors. Bug Bracelet is great for biking, hiking and all outdoor activities. Keep Bug Bracelet handy for everyone in the family. Bug Bracelet goes anywhere! Keep a few in the golf bag, car or at the cottage. 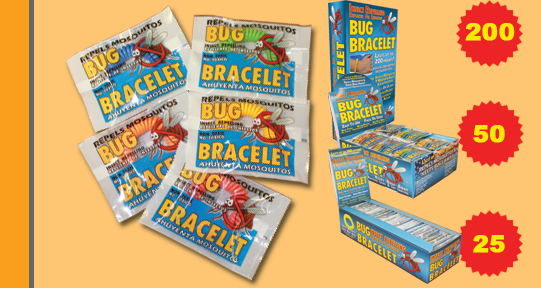 The Insect Repelling Bug Bracelet is non-toxic, waterproof and safe for all ages. The Bug Bracelet is completely recyclable per local guidelines when they are no longer effective. With over 90,000,000 sold worldwide, our products continue to be the best natural protection available against biting insects. People love the fact that they can use our products to create an invisible shield around them to keep insects away. Material Breakdown The Bug Bracelet is made with three natural oils. These oils are safe, non-toxic insecticides. By using the Bug Bracelet you won’t subject yourself, your family, or your children to dangerous chemicals. We are committed to using only the highest quality botanical oils. We source out the highest quality Indonesian lemon grass oil, Philippine geraniol oil and citronella oil available. Mosquito & small flying insect repellent. Use as a expanding wristband or ankleband.